King Street Designs uses natural dyes and traditional Japanese Shibori techniques to produce patterns on scarves, t-shirts, skirts, hats, baby clothes and napkins, along with other apparel and household items. These Shibori products are made with either 100% cotton or natural silk or rayon. A unique aspect of King Street Designs is that the dyes it uses for Shibori products are often made at the King Street Design Studio in Hillsborough, NC, and these dyes are completely organic. They are made from such plants as golden rod, black walnuts, comfrey, pokeweed, bloodroot, oxalis and other locally grown and locally foraged plants. Other natural dyes used at King Street Designs include cochineal, logwood, turmeric, avocado, artichoke, and indigo. 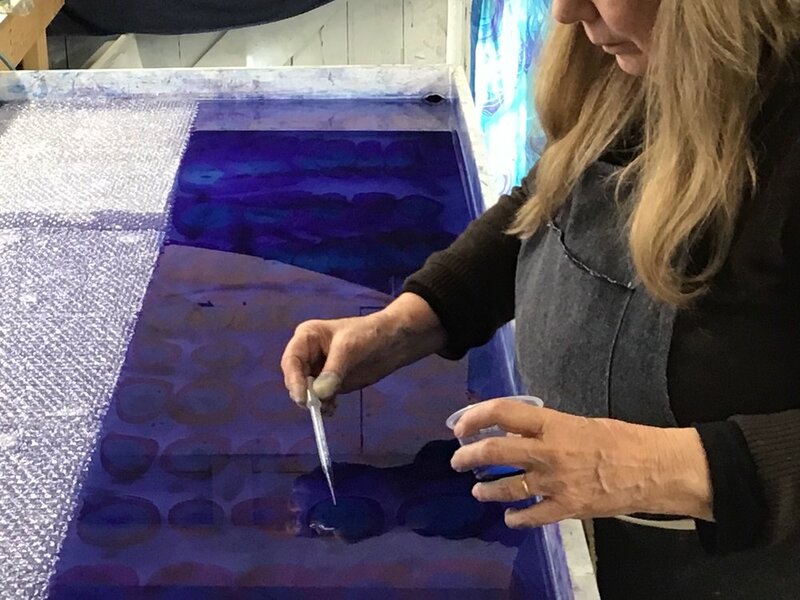 Recently, King Street Designs has also been doing traditional marbling techniques using large tanks of methocel on which inks are floated and then combed to produce marbled patterns on shirts, skirts, hats, scarves, napkins and other household textiles. King Street Designs also produces custom orders on request at christinabnova@gmail.com.